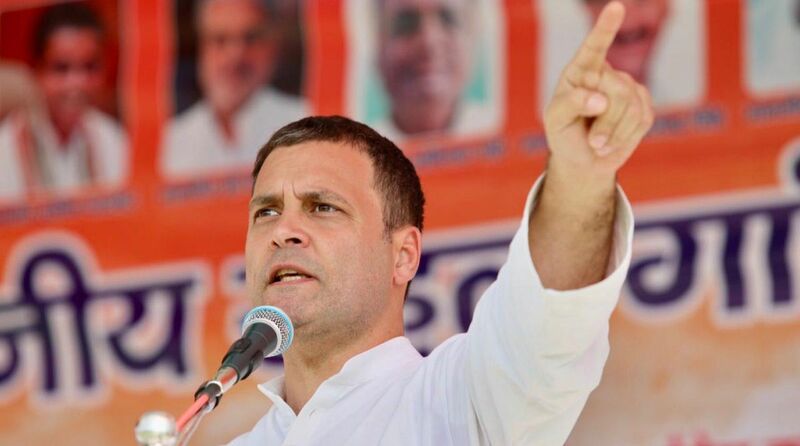 In the wake of fresh “revelations” by a French online investigative journal “Mediapart” about the controversial Rs 30,000 crore offset contract related to the Rs 59,000 crore Rafale fighter jet deal between India and France, the raging row over the alleged Rafale scam snowballed with Congress president Rahul Gandhi today calling Prime Minister Narendra Modi “corrupt” while demanding a probe against his role in the Rafale deal. Charging that PM Modi was a “corrupt man” who allegedly helped industrialist Anil Ambani “pocket” Rs 30,000 crore offset contract related to the Rafale deal, Gandhi even asked Modi to tender his resignation. A report in Mediapart ~ citing an internal document of the French manufacturer of Rafale jets, Dassault Aviation ~ has reportedly stated that Dassault was forced to enter into a joint venture with Anil Ambani’s Reliance Defence for the offset contract as part of a “trade-off” that was”imperative and obligatory” for the French aerospace giant to bag the multibillion-dollar deal for selling 36 Rafale fighter jets to India. The Mediapart report said that Dassault’s Chief Operating Officer Loik Segalen had explained to his staff at a presentation on 11 May 2017 that the joint venture with Reliance Defence was “imperative and obligatory” for Dassault Aviation to get the Rafale deal. Addressing a press conference at the Congress headquarters here, Gandhi repeatedly questioned PM Modi’s “deafening silence” on the spiralling Rafale controversy. “The Prime Minister of India is corrupt,” Gandhi alleged, saying “Allegations of corruption are being levelled against him and the Prime Minister is silent. He should resign if he cannot respond”. The Congress chief also read out excerpts from the Mediapart report, highlighting a remark purportedly made by Mr Segalen that for Dassault the choice of Reliance Defence was a “compensation” for obtaining the Rafale deal. A few weeks ago, Mediapart had quoted former French President Francois Hollande as saying that France was given “no choice” on selection of the Indian partner for Dassault and that the Indian government had proposed the name of Anil Ambani’s firm for a joint venture with Dassault for the offset contract linked to the Rafale deal. The Modi government and the ruling BJP have rejected these allegations as unfounded and baseless, maintaining that the government had no role in Dassault’s choice to partner with Reliance Defence. Dassault has also denied such charges, insisting that the seletion of Anil Ambani’s company was its own choice. corruption” against PM Modi in the Rafale deal, Gandhi alleged, ridiculing the BJP-led government and Finance Minister Arun Jaitley for “running away from a Joint Parliamentary Committee probe into the Rafale matter”. He said the irony was that Modi had come to power on the promise of fighting corruption. Gandhi also described Defence Minister Nirmala Sitharaman’s ongoing visit to France as part of a “huge cover-up” by the Modi government on the Rafale deal. During her three-day France tour, Sitharaman is likely to visit the Dassault factory. “Why has suddenly the defence minister rushed to France? What is the emergency?” he asked. Meanwhile, commenting on the latest Rafale flare-up following the Mediapart report, Dassault Aviation reportedly said that it has “freely chosen to make a partnership with India’s Reliance Group”. It said partnerships have also been signed with several other companies. Dassault said on 11 May 2017, its COO Segalen had informed the Central Works Council of the creation of the Dassault Reliance Aerospace Limited joint-venture “in order to fulfill some of the offsets commitment”. On Dassault’s rebuttal, Gandhi said the Rafale jet manufacturer was “sitting on a huge contract and will say what the Indian government wanted it to say”. The BJP hit back, rejecting Gandhi’s allegation of corruption against PM Modi in the Rafale deal. BJP spokesman Sambit Patra accused Gandhi of “lying through his teeth shamelessly” and indulging in “politics of misinformation” to build his political career. The Congress has been alleging massive irregularities in the Rafale deal, charging that the Modi government was procuring each Rafale jet at a price of Rs 1,670 crore as against Rs 526 crore finalised by the previous UPA government when it was negotiating the procurement of 126 Rafale aircraft.